Da Bears Blog | Finding A Quarterback: No Interest in Mitch Trubisky? Finding A Quarterback: No Interest in Mitch Trubisky? 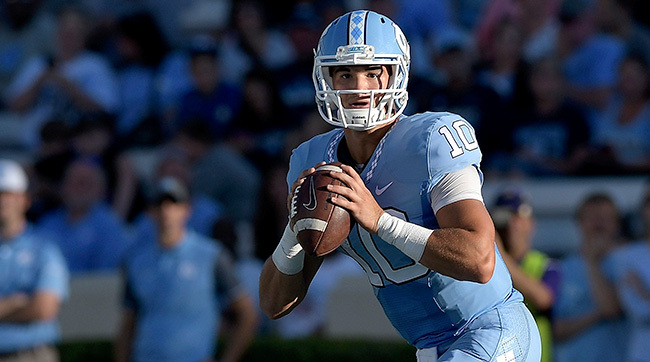 There has been almost nothing to link the Bears to North Carolina quarterback Mitch Trubisky, which is exactly why I think they really like him. After sending a team of people, including Ryan Pace and John Fox, to Clemson for Deshaun Watson’s workout, the Bears didn’t send anyone of note to see Trubisky this week. There were also no reports of Pace going to watch Trubisky during the season. Really, nothing has connected Pace and the Bears to Trubisky other than a standard interview at the combine. I have a hard time believing Pace would be this transparent. If he really wanted Watson and not Trubisky, why would he be so obvious about it and risk somebody moving ahead of them to take Watson? It’s weird and, if that’s really what he’s doing, it’s stupid. I don’t think Pace is stupid. Pace said he experience is important and Trubisky only had one year as the primary starter at North Carolina. Of course, Kevin White only had one year as a star at West Virginia before Pace made him his first ever draft pick. If Trubisky had gone back to North Carolina for his senior year and had the exact same season he just had, he’d be the consensus first overall pick next year. And, while he only has one year as the primary starter, he has nearly as many pass attempts as Aaron Rodgers and Carson Wentz had coming out. He also took a significant number of snaps in three separate seasons, which could answer the questions about experience for some. There were numerous reports last year that the Bears really like Carson Wentz and, in 2015, it’s well known that they wanted Marcus Mariota. Two guys who are big, mobile, have big arms and didn’t throw interceptions in college. That description (although he’s a couple inches shorter than the other two) also fits Trubisky, who was intercepted on just 1.7 percent of his passes in college. He made some big time throws last season. One of my favorite games of his was actually the Stanford game in which the general perception was that he was terrible because he made two horrendous decisions, but there was a lot to like.He kept battling, despite the constant pressure and gave his team a chance to win with a great touchdown late. If the offensive line doesn’t crumble on the two-point conversion, we just might be talking about the Stanford game as a great comeback for Trubisky. My biggest problem with Trubisky was that I never felt like I was watching greatness. He has as much ability as anyone in the draft, but I felt l like he should’ve been more dominant than he was. He was surrounded by really good collegiate talent, which really helped him. There were times when I wanted him to take games over and he just didn’t. He’s not my favorite quarterback in this draft, but if the Bears took Trubisky third, I’d completely understand it. There are no signs that that is going to happen, which, perhaps, is exactly why we should think it is.